Some years ago I registered the domain name londonphotographs.co.uk with the aim of setting up a web site called ‘London Photographs’ that would display my archive of images of Greater London taken since the 1970s, and it still provides a ‘front end’ to much of my work on the city, although I think all of it can also be reached through other domains that I also have. Looking at the weather this last weekend I decided to use the time to work on another project for ‘London Photographs’, related to the book London Dérives that I completed a week or so ago. 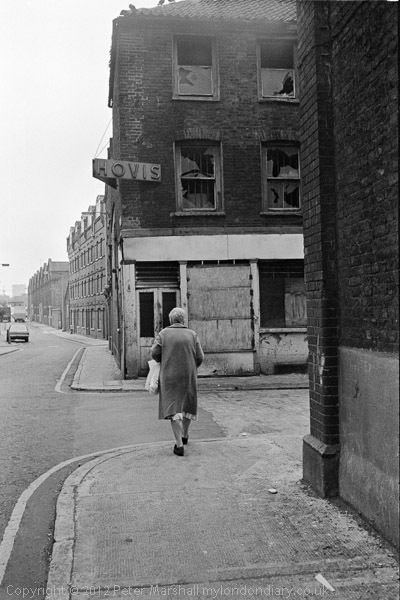 The web site London Dérives isn’t the same as the book, although I think it includes all of the 73 images from the book (or near duplicates) but has almost 200 images. It includes the key text from the book related to the project. 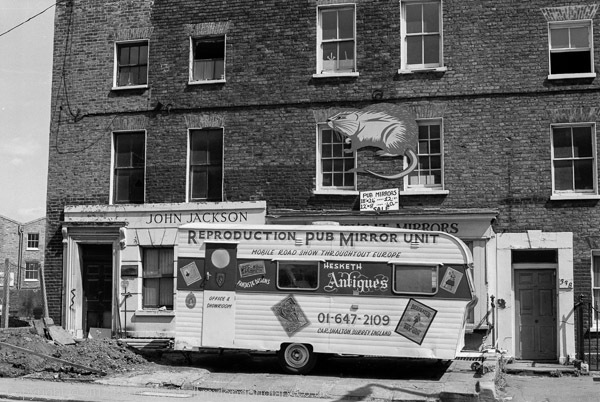 My caption says John Jackson & Pub Mirrors, London 1978, but where was it? What took most time was going through the images again and adding captions. 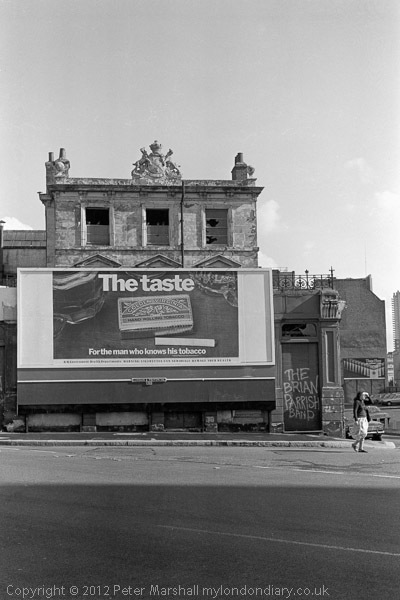 I’ve never been too good at keeping records of what I’ve photographed or where, but from around 1986 on I began to carefully annotate my contact sheets with things like Grid References, street names and other information while it was still fresh in my mind. But prior too that, it often involves a little detective work, looking at the series of frames for a particular walk, hunting for clues in the images, resorting to maps (on and off-line), Google searches, and sometimes even satellite images, StreetView or Bing’s rather nice Bird’s Eye views. But finding places can be pretty tricky as many buildings have been demolished and others built. This was near Brick Lane, but exactly where? Looking at some pictures, even from 35 years ago, I get a very clear impression of where I was and exactly what I was thinking when I took them, though these are not always entirely accurate. One image I was convinced was made close to the British Museum turned out – when I examined the evidence closely – to have been made around 6 miles to the north. 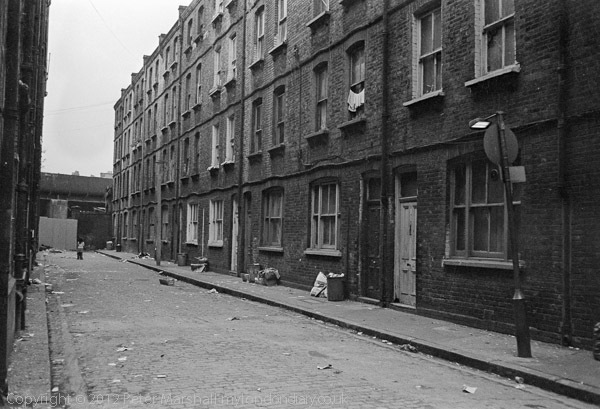 And this wasn’t far away from Brick Lane either – but which street? The site is now on the web, but I’m sure I’ll make some changes to it. But I’d be pleased to get any comments and suggestions on it and to get more accurate captions for some images. I haven’t put a comments form on the individual pages of the site, but I’d be happy to add suitable comments at the bottom of the pages. On its top is a rather fine (if damaged) coat of arms with the motto ‘Sapere Aude’ – dare to be wise – which is apparently that of both the Wise and the Whittington families. Whittington seems more likely to be the connection. Obviously the building is in a poor state, but has a certain distinction, and might well have been renovated – or it might have been replaced by offices or flats. Looking at the image full-size doesn’t really yield any more clues other than making the motto just legible. Anyone? Most of these pictures were taken either on a Leica M2 with a 35mm lens, and Olympus OM1 or one one of a series of Minox 35 cameras I owned. For some of them I was trying to get a feeling of glimpsing the sites on a walk and deliberately framing slightly oddly and sometimes with the camera not level. Some of these I’ve tidied up a little with cropping or rotation, and with a very few some correction of the verticals, but most I’ve left as I took them. This entry was posted on Monday, February 11th, 2013 at 02:22 pm and is filed under My Own Work, Photo History. You can follow any responses to this entry through the RSS 2.0 feed. You can leave a response, or trackback from your own site.